The Chocolate Muffin Tree: Green Guacamole For St. Patrick's Day! I think it is so important to create in the kitchen with your children. I've been letting my daughter help me in the kitchen since she could hold a spoon! She loves to help and always pulls up a chair to the counter and wants to at least see what I am doing! We've made so many recipes together. Our most recent endeavor has been to make this incredible guacamole recipe from my brother! (YUM!) 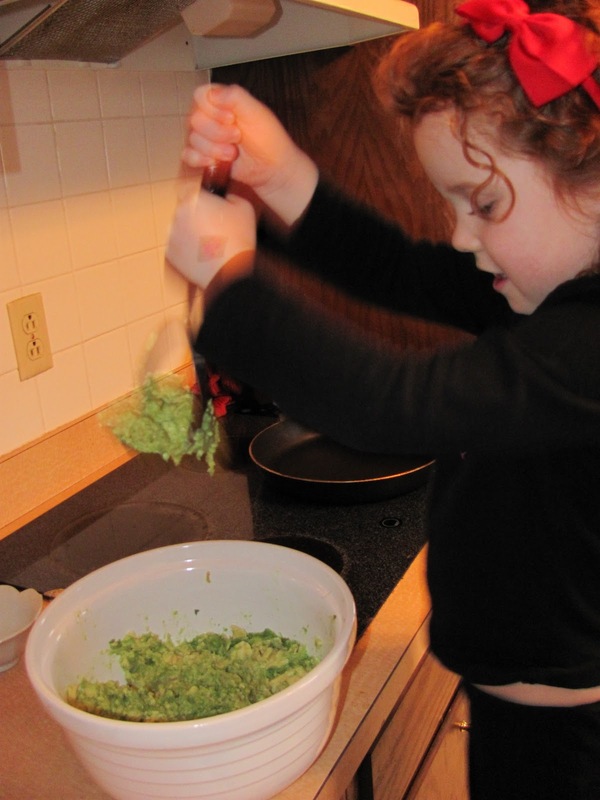 My daughter loves avocados, but hasn't really acquired a taste for guacamole yet, but she enjoyed helping to make it!!!!! I let her slice the avocado (after it has been halved, seeded, and peeled) with a butter knife and it is so easy for a young child to cut because it is so soft! She loves avocados sliced with Italian Dressing! Great photos! Using the masher looks like a lot of fun! I like having my kids use butter knives for cutting as well, we make apple pie from scratch, and have made vegetable soup, and it is so satisfying for me to observe the pleasure they have in using real utensils to chop with, and butter knives work, and are quite safe. 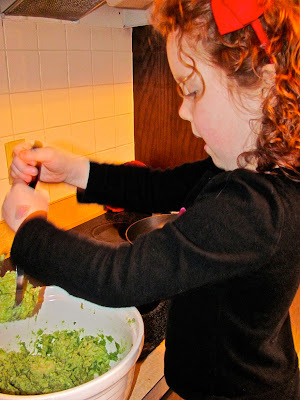 We are having a St. Pat's party this Thurs., and now I have a wonderful activity - we'll make the guacamole - a wonderful fun part activity, and yummy to eat! Mmmmmm! Looks tasty! We also have some fun treats planned this year for St. Patty's. . . isn't cooking with kids so much fun!!? Just wanted to thank you for popping in today to leave a comment on my blog. I think I might leave out the onion and spices for my kids. I'll drop in after St. Pat's Day, and let you know how the guacamole turned out! Love guacamole! I really like the name of your blog (with the reason behind it).